An elite, non-smoking property consisting of a large, newly-furnished, five-bedroom, five-bath home and an adjoining two-bedroom, two-bath, guest cottage. This beautiful property is located on the 18th fairway of the prestigious Ocean Golf Course in exclusive Sea Pines Plantation. The property is a short walk to the beach, and near the ' NEW Beach Club.' The beach club has a lifeguard on duty, restrooms, and a restaurant. This luxury home has a gourmet kitchen with Corian counter tops, an over-sized dining room, and large gracious living area. The beautiful master overlooks a private pool and the golf course. The house is newly decorated. The cottage has a separate living, dining, and kitchen area. A gazebo and furnished patio are ideal for outdoor entertaining. 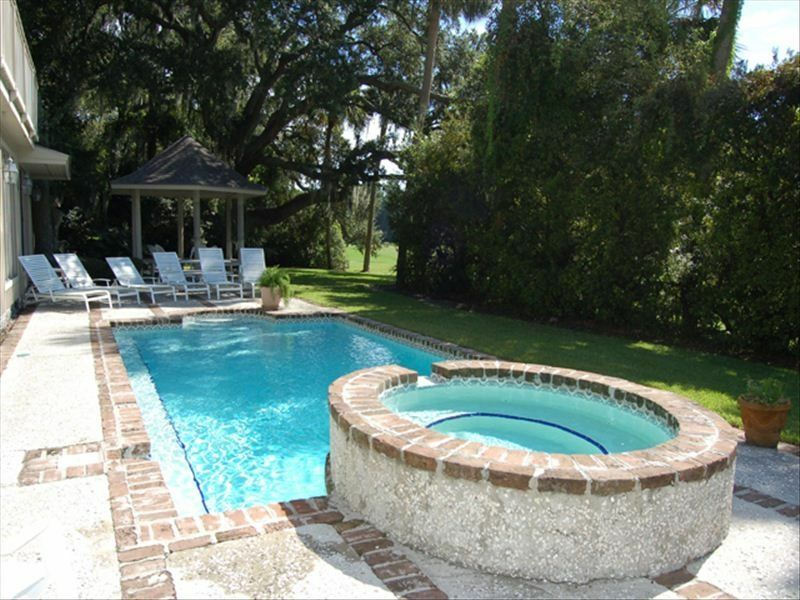 The property is located near the Marsh and Plantation Golf Club. Harbor Town is minutes away!!! We have arrangements with Riding Tigers Bike Rentals to obtain discounted prices on weekly bike rentals for our guests. Mention this property to get the discount. We frequently stay at HH and this house will be a repeat for us. Super location near the Beach Club. Super nice owner! We stayed Thanksgiving week. Whole family 14 of us. Had a really good time. Ages 6 years to 81 YEARS. Would rent house and pool house again. Glad you enjoyed your Thanksgiving week! Great property and great owner. There were 10 of us on a 4 day golf vacation. Tons of space for hanging both in and out. Plenty of bathrooms. Kitchen was great. Can't say enough about the property and Sea Pines is a great area. The owner was responsive and allowed us to arrive a day early due to hurricane Michael. Highly recommend and we hope to return some day. Thank you for your kind remarks. I’m happy you enjoyed your time at beautiful Sea Pines! We just spent an enjoyable week with our family at this welcoming, beautifully decorated home on Hilton Head. Our 13 family members all enjoyed the ample common areas where you could gather for games, eating, or just “hanging out.” The extra house allowed for all of us to spread out with large bedrooms and bathrooms. Everything was just as described, only moreso. We shared dinner with close friends and their family, who were staying nearby on several nights. It was a perfect place for cooking and grilling in the great kitchen with the abundance of utensils and equipment, along with the ample supply of dishes, glasses, and silver. Outside fun in the pool and lots of conversations at all hours under the gazebo! Picnic table was great for outside eating. All the vegetation and the manicured yard with the golf course beyond the bushes gave you a great sense of privacy. Beach and all the activities in the area were very convenient. Lots of walking and biking! The owner Jay was very acommodating and extremely easy to work with! The home made you feel very welcomed like you were at a friend’s house — the hosts just weren’t there! We’d love to come again!! We loved the spacious living area. The bedrooms are equally spacious and nice. The pool and gazebo are such added bonuses to an already wonderful home!. Biking to the beach is only a short trip or you can walk. We highly recommend this home! Thank you for your lovely comments. I'm thrilled that you had a wonderful vacation. Our family stay at Sea pines was wonderful. The location, the amenities, the atmosphere was awesome. The owner was more than gracious. The fact of having a cottage separate from the main home allowed my husband and I even more comfort. We even started bike riding again. We would definitely rent from that location again when in the area.